Benjamin Franklin once said: I wake up every morning at nine and grab for the morning paper. Then I look at the obituary page. If my name is not on it, I get up. Franklin’s sentiment is evident in the title of this week’s Torah portion, Vayehi, literally, “and he lived.” The portion deals largely with the death of Jacob the Patriarch and, later, the death of Joseph. Despite the prevalence of death, the first word of the portion affirms life. The Sages note mah zar’o ba-hayyim, af hu ba-hayyim, so long as his children live, so long does the parent live; even after Jacob dies, he lives on by virtue of the legacy he passed on to his children. 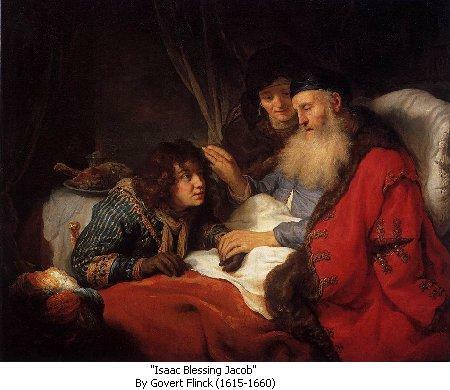 On his death bed, Jacob affirms life by offering blessings to his sons and grandsons. A strange thing happens, though. Some of the sons don’t fare as well as others in receiving their last testament from their father. Shimon and Levi stand out for the harsh rebuke they receive from their father. Shimon v’Levi ahim, klei hamas m’cheiroteihem. Simeon and Levi are a pair; Their weapons are tools of violent lawlessness (Gen. 49:5). The text continues: “Let not my person be included in their council, Let not my being be counted in their assembly. For when angry they slay men, and when pleased they maim oxen. Cursed be their anger so fierce, and their wrath so relentless, I will divide them in Jacob, Scatter them in Israel (6-7). Jacob had the blessing of living out the full measure of his days, some 147 years. Today, though, we recall a day of horror in our nation in which innocent children were denied the right to live out the measure of their days. December 14 marks the first anniversary of the bloodbath that occurred at the Sandy Hook school in Newtown, CT. Twenty first-graders, all of them age five or six, were shot to death in school in cold blood, along with six teachers. More than any other shooting tragedy in recent memory where innocent people have been shot to death in schools, movie theaters, and grocery stores, this tragedy captured the attention of the nation. Millions of Americans voiced outrage at the easy access to guns and ammunition available to mentally ill people and people with criminal records. Millions of Americans voiced outrage at the easy access many people have to sophisticated, military-grade, automatic weapons and ammunition. There was a widespread sense that common-sense legislation would be enacted to respond to this scourge of our country. Tragically, the legislation that would have kept guns out of the wrong hands died last April in a tone-deaf Congress, despite polls showing 90% support for the legislation. In the meantime, in the last year alone there have been 26 other school shootings, mostly in minority communities that don’t attract the press coverage of mostly white communities like Newtown. It’s estimated that some 38,000 people have died in the last year as a result of gun violence. This country is a nation of laws, and when children are dying, yes, existing laws need to be enforced. At the same time, when it’s obvious that there are systemic flaws, new laws are necessary to fix the system. With Shimon and Levi in the Torah, their weapons of violence became their habitations. They became possessed by their weapons and were defined by them. When they were angry, they would slay men. The echoes of Jacob’s rebuke of his sons ring true today. Our society has become habituated to gun violence and indifferent to its consequences. If we remain silent and complacent, how many more thousands will be left dead by next December? 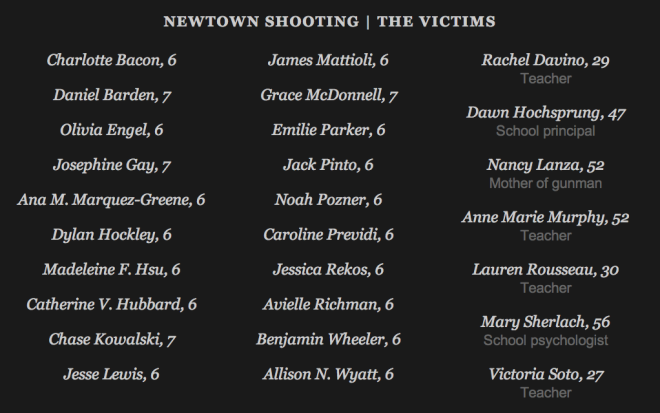 Charlotte Bacon, Daniel Barden, Rachel Davino, Olivia Engel, Josephine Gay, Ana M. Marquez-Greene, Dylan Hockley, Dawn Hochsprung, Madeline F. Hsu, Catherine V. Hubbard, Chase Kowalski, Jesse Lewis, James Mattioli, Grace McDonnell, Anne Marie Murphy, Emile Parker, Jack Pinto, Noah Pozner, Caroline Previdi, Jessica Rekos, Avielle Richman, Lauren Rousseau, Mary Sherlach, Victoria Soto, Benjamin Wheeler, Allison N. Wyatt—may their memories be for a blessing.